I was on my elliptical. Vigorously moving while replaying in my mind every terrible, unhealthy thing I consumed during my trip to New Orleans. Why yes, I did eat two Crystal burgers laying in the hotel bed after a night out. My cell phone began to ring. I didn't recognize the number, but I answered it as the Comcast guy was making a trip out to fix some issues. Maybe he was calling about what time he'd be here. RUDE LADY: Did somebody call me? It was her tone that was most offensive. It was accusatory and rude. And by the way, SHE was calling ME! After our engaging conversation ended, my mind reeled with anger. How could a total stranger be so rude to me? There were a million ways she could have asked me if a call had been made from my phone to hers, she chose the worst possible way. Maybe I should return the favor. I DO have her number now. How would she like it if I kept phoning her and accusing her of things she didn't do. MRS. YOY: Did you burn the corn muffins in my oven? MRS. YOY: Did you forget to take out the trash and recycling? AGAIN? MRS. YOY: Did you remember to pick up Mr. Yoy's drycleaning? Oh, the fun could go on and on. But I do have a point, shockingly. Manners. What happened to them? I am horrified on a daily basis of the rudeness of our country. I just returned from South Florida, so I've been digesting a double helping of rudeness from my time spent there. It makes me sad for my kids. But I'm not giving up hope! 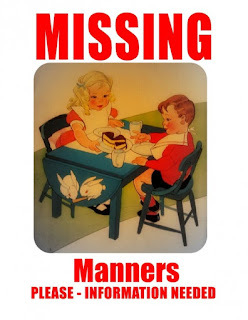 My children WILL have manners. They may be dirty and unfed, but they will say please and thank you and if they FORGET I will remind them. I pray I am not alone in this quest. Nope, you're not alone on your quest. 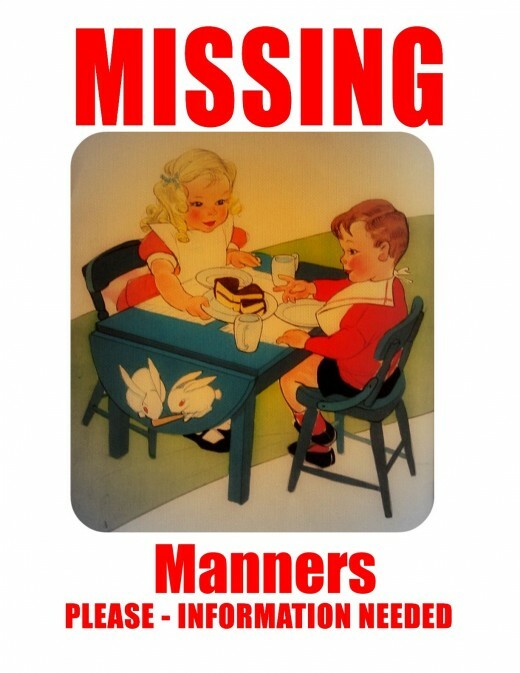 Manners are very important! Yes, everything is working great! Thanks for checking! I've Been Blogging For 2 Years! Big E: Stick to the Script!